Do the words empower you? Do they make you feel overwhelmed? Like jumping in and rolling up your sleeves? Or do they seem to be saccharine-ized versions of issues that you are passionate about? What about words like: oppression, racism, sexism, ageism, ableism (or other -isms) or power, privilege and rank? Do these words do a better job of hitting the mark for you? Or do they make you uncomfortable? In this series, we will look at how power, privilege, rank and culture influence our clients, ourselves as coaches, and our profession. Our assertion is that we limit our success and impact as coaches if we ignore the dynamics of social and cultural identities, power, privilege, and rank. Yet so often, while we may pride ourselves in being bold in other aspects of coaching, we tiptoe around these issues as coaches. We need to educate ourselves and examine the –isms that are alive in us, in our clients, in our institutions, and in the larger environment in which we work. Most coaches we know believe that what we do is create space for people to show up fully, to bring all parts of themselves, and to be fully expressed. It is a unique strength of our profession. We know that an inextricable part of each of our clients emerges from how they are celebrated and how they are marginalized in all areas of their lives. This affects how they experience the world, how they interact with others, and even how they view themselves. We believe that ensuring we have done our own work and are educated and practiced at bringing issues of difference to our coaching interactions is critical to maintaining our integrity as a profession, to being who we say we are as coaches, and to staying relevant. Why does examining difference matter to you? to the profession of coaching? Consider the ways you identify personally. Why do those different identities matter? What impact might they have on you as a coach? What impact might they have on how your clients see you and work with you? The Expert Series is brought to you by choice Magazine as part of our ongoing efforts to bring opportunities for learning and growth to the coaching community. 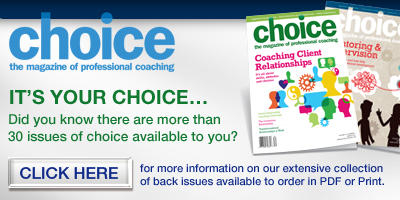 Delivered in four parts every two weeks, each series covers useful topics http://www.choice-online.com/expert-series-archive/ for business development and coaching insights, serving the needs of leaders in all areas and walks of life. Archived copies of previous series can be found here.